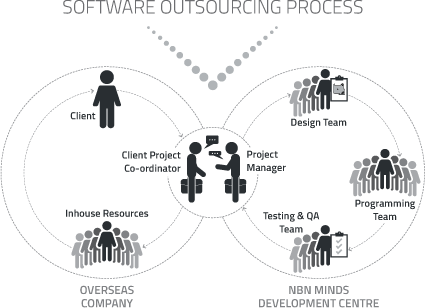 Determined to deliver best in class software outsourcing services varying from first-hand business solutions to redesigning the existing software products. NBN Minds is not merely a software outsourcing service provider but a legacy built on more than a decade of experience, industry expertise and collaborative efforts of likeminded senior developers with an average experience of 6+ years. We have handled challenging software outsourcing products on international front and delivered cutting edge solutions to our clients in countries like South Africa, Denmark, Spain, Ireland, and USA. Our team of experienced professionals ensures to provide end-to-end product development solutions to startups at minimized cost and reduced turnaround time. Businesses can rely on our expertise to offer custom solutions, exclusively designed to digitalize their business and enhance its efficiency. We provide strategically tailored software engineering solutions for start-ups, SMEs & enterprises worldwide. Our Methodology is what makes us preferred choice for outsource mobile application development and software engineering solutions. We work in a systematic way to understand your requirements, prepare prototype to meet your design expectations, implement your ideas, program and test the final product, followed by a remarkable promise of effective maintenance. We ensure to work as your own backend team during the whole software development process, offering free project consultation, time estimation and timely project reports. We are team of small headcount relatively, which is an opportunity for us to house each project with in-depth attention. Our visionary product engineering strategists and efficient project managers, powered by horizontal hierarchy setup, deliver efficient results in lesser time. Rather than developing the entire software in one-go and showing the client at the end, we use the innovative approach. We breakdown the software development process in small steps and get client’s feedback when every step is completed. That’s how client is informed about the software development process throughout and improvements are handy. We have empowered our solutions with smooth communication setup. Our experts brainstorm the ideas, lay down strategies to reach the goals effectively and implement the same in efficient way. Our team keeps you involved throughout the software development process through our transparent communication process. We seek your inputs, provide you regular updates and incorporate your inputs. Our end-to-end solutions include comprehensive spectrum of IT application outsourcing ranging from UX/UI Design, software engineering, re-engineering, consultation, mobile app development, testing and web backend solutions. Quality is our main mantra. From planning till final launch, we hunt and shoot bugs, fix errors and run checks to ensure effective quality of the final product. You can count on our skilled and dedicated support & maintenance team to offer you long-term solutions and make your software engineering solutions run effectively. When you choose our services, you can be 100% sure about transparency and respect towards your idea and data.